Over the last 30+ years, powder coating has revolutionized the finishing industry by providing a superior, durable, environmentally friendly finish - particularly for metal products such as appliances, automotive parts, sporting goods and countless other products. Powder coating is now the fastest growing finishing method in North America. Now, a second powder coating revolution is underway. Technological advancements in powder coating materials and application and curing methods have brought the advantages of powder coating to heat sensitive substrates. Powder coating is now used on a variety of products that were thought impossible just a few years ago. One of the biggest breakthroughs for powder in the heat sensitive substrate market is on medium density fiberboard, or MDF, a combination panel bonding particles of wood with a synthetic resin. MDF is very suitable for powder coating application because of its low porosity and homogeneous surface. 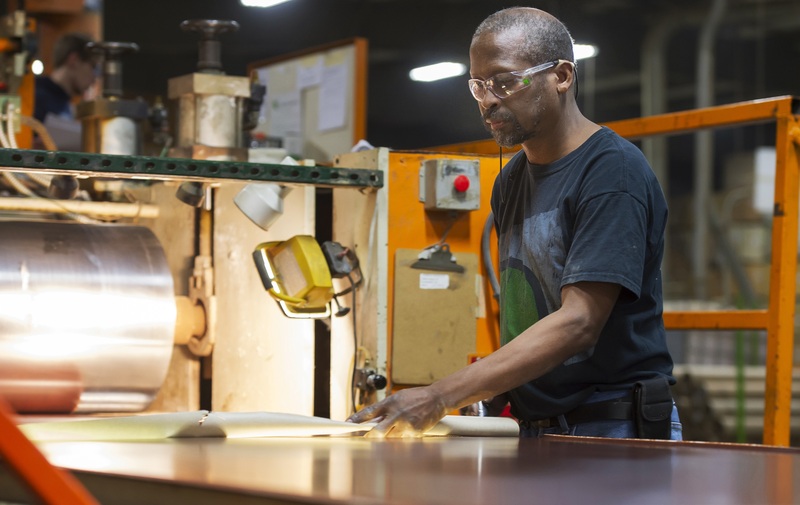 MDF products include office furniture, kitchen and bath cabinets, doors, store fixtures and displays, barbecue trays and ready-to-assemble furniture for the office and home. Powder coating is revolutionizing the MDF market because it offers design freedoms other finishing methods and laminating processes just can’t provide. Powder coating provides a beautiful, durable, seamless finish in every color of the rainbow. And, powder coating protects MDF products from chips, stains, spills, and scratches. Many office furniture makers are moving away from standard shapes such as squares and rectangles to more rounded corners and contoured edges, with interior circles and ellipses to allow for computer cords to drop through. They are also offering seamless desktop coatings and a variety of colors and effects. Powder coating can accommodate these shapes, while current lamination techniques, which rely on edge-banding methods, cannot. And powder application is a one-step finishing process, not requiring successive coats or a long time to dry. 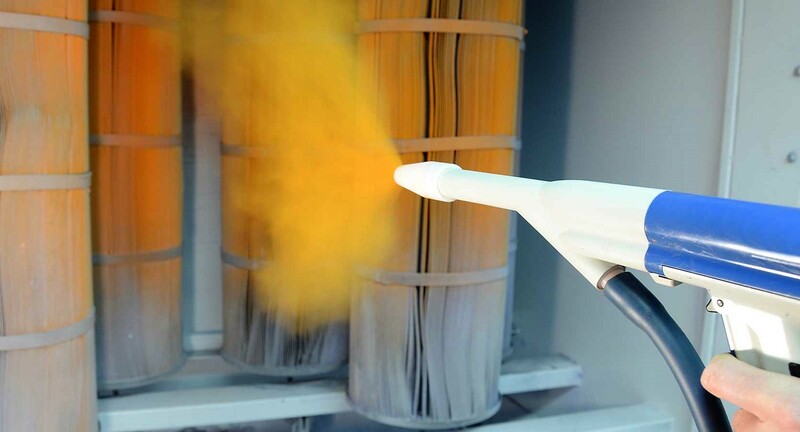 Powder coating is a dry finishing process, using finely ground particles of pigment and resin, which are electrostatically charged and sprayed onto a part to be coated. The charged particles adhere to the parts until melted and fused into a tough, even coating through the application of heat and energy. Some woods and wood products such as MDF have sufficient and consistent moisture content to provide conductivity and can be coated directly. 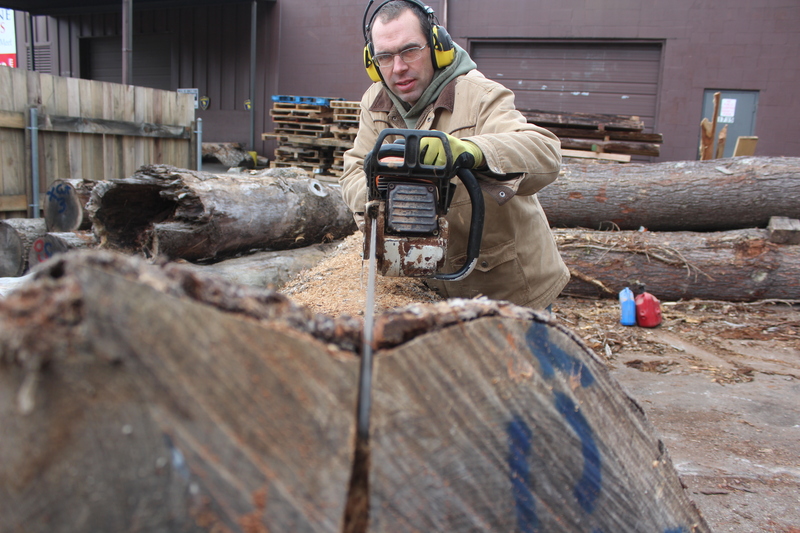 Wood parts that require sanding can be cleaned with compressed air to remove any surface contaminants. To enhance electrostatic attraction, wood can be pre-treated with a spray solution that provides a conductive surface. The part is then preheated to a desired coating temperature, which softens or partially melts the powder when it is applied and helps the powder adhere to the part where it melts and little on impact. A uniform board surface temperature allows for high transfer efficiency and consistent appearance. For powder application, an electrostatic charge is applied from the spray gun to deposit powder on the MDF surface. Powder materials for MDF can be either thermal cure powders or UV-cured powders. Thermal cure powders rely on infrared ovens, convection ovens or hybrid ovens that combine infrared and convection heating. The thermal energy melts the powder so it will flow into a level film and eventually cure, or crosslink, into a finished film. With specially formulated UV-curable powders, the melt and flow can be separated from the curing process and requires minimal heat to cure the powder. After the parts enter an infrared or convection oven where the coating melts and flows for two to ten minutes, the board is exposed to ultraviolet light for just a few seconds for final curing and hardening of the finish. Then the parts cool naturally or in a cooling tunnel before they are unloaded from the coating line. Negligible VOCs - Powder coatings contain no solvents and therefore emit negligible, if any, polluting VOCs into the atmosphere. Less exhaust - Powder coating is a clean process, allowing exhaust air from the coating booth to be returned to the plant, and less oven air is exhausted to the outside. Reusable overspray - Up to 98% of powder overspray can be retrieved and reused. No costly waste disposal equipment - Unused powder can be reclaimed and returned to a hopper for recirculating through the system, with negligible waste. Powder coating is an economical and efficient operation. Greater operating efficiency/lower unit costs - No drying or flash-off time is required. Parts can be racked closer together on conveyors and pass more quickly through the production line. Lower reject rates - More parts can be coated automatically with fewer rejects because powder coating does not run, drip or sag. High utilization efficiency - With proper application equipment, powder materials and efficient recovery methods, one-coat application and 95-98% powder utilization efficiency are readily available. If more than one color is desired, color changes can be made quickly. Lower personnel costs - Minimal operator training and supervision are required for a powder line. Employees prefer working with dry powder because of lack of fumes, reduced housekeeping problems and minimum clothing contamination. Simplified permit process - The permitting process for a powder coating operation is simpler. Compliance with federal and state regulations is also easier, saving both time and money. Most importantly, powder coating provides a durable and high-quality finish, with a wide range of performance properties including excellent resistance to impact, abrasion, heat, stains, extreme weather and fading from sunlight. Texture selections range from smooth surfaces to a wrinkled or matte finish. Rough textures are also available, designed specifically for hiding any surface imperfections. And color selection is virtually unlimited, including clearcoats. In addition to successfully penetrating the MDF market, powder has proven to be an effective finishing choice for other heat sensitive substrates such as plastic parts made of nylon and polycarbonate and assembled products such as appliances, electric motors or automotive radiators. Because of advancements in low temperature cure powders, plastic parts and wires and rubber seals and gaskets are not damaged in the powder coating process. And the revolution has just begun. Successful testing has occurred on hardwoods such as beech, oak, ash and walnut. Research engineers are studying the use of powder on paper-laminated MDF, laminated flooring and particleboard. Research is also being conducted on countertops, wood moulding and trim, all of which will increase demand for, and use of, powder coatings in more new markets.